LAST year, following publication of the road- test report on the RD400 Yamaha, the opportunity arose for a very long "track test'' of this popular model . . .no less than six hours of more or less flat-out motoring. The occasion was the 700km British Formula Racing Club's production machine race to be held over the Cadwell Park 1 .5-mile circuit. The event had attracted 30 teams, these being split into two classes, l 5 teams up to 500 cc and l 5 of the 1000"s- over two days, with 400km (266 laps) on the Saturday and the remaining 300km (124 laps) the next day. 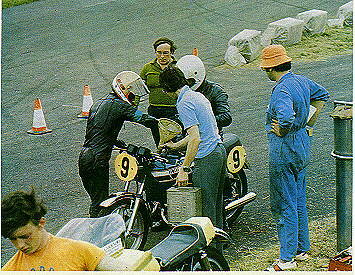 I was entered with John Musson who owns the Yamaha and had been racing it for the previous three months. The only modifications which he had carried out were replacing the Japanese tyres with TT l00s, the fitting of straight handlebars, and rear-set footrests. The rest of the machine was absolutely standard. As l had never raced a two-stroke before, my first practice session was taken as a get-to- know-your-machine trip, the main concern being my approach to corners. After all the tractability I had been used to with my 750 Norton, the Yamaha's six gears and no overrun braking had me guessing a little. Apprehension soon passed ; the machine was so easy to drive, so comfortable, with very positive handling and controls, that l completed the session quite at ease and satisfied with my lap times, with plenty of confidence in the RD 400 and looking forward to driving it under competition pressures for 350km. Let me outline the Carrell circuit . . . from the start line we have a very slight downhill straight for about 250 yards to the hairpin, which exits on to a short level approach to a left-hand hill which bears right before the apex, continuing right and known as Charlies, which becomes a slightly curved straight, uphill for the last 400 yards. Then comes a 90 degree right-hander (Park); this leads to a very long right-hander (Donington) terminating in a left- hand flick (Gooseneck) on to a very steep downhill approach to another 90 delve left- hander (Mansfield) with just 100 yards to the start. The average lap times for this demanding 1 1/2 mile circuit is about lm 22s. For the event the pit area was situated opposite the start area. in a small slip-road which is normally part of the stock car circuit.To enter the pits one had to come around Mansfield at a very slow pace or else cut across the grass (a crime !) At the start of the race John Musson managed a fair getaway, and with the 30 seconds handicap was circulating in about fifth position. First, along the straight, using sixth (top) gear and with the rev-counter reading 8,500/9,000 the speedometer showed only 95/97 mph. This figure could not be improved on, no matter what seating position one adopted . . . prone, or flat on the tank. After a few experimental laps I discovered that I could go along the straight in fifth gear, revving to 9,000 and still get almost precisely the same speed. I preferred the flat-in-fifth approach, for it made the change-down for Park easier with a better pull around the corner in third gear, which could then be held for the long haul around Doningtom, just getting into fourth for a short stretch before a change-down, without braking to continue driving through the Gooseneck. Then comes the main braking test, the down- hill approach to Mansfield. Very careful use of the rear brake here as a little too much effort would cause the rear disc to lock up. The effect was exaggerated due to the very effective front disc. If at this point one did lock the wheels the peel off would be that much later making the grass or slip-road come up very quickly (an exit line sometimes accepted gratefully-though of course the clock doesn't stand still on these occsions and one's lap time suffer). From this point it's hard acceleration, reaching third gear at about 70 mph on the short drop to the hairpin, taken at 10/15 mph in bottom with the clutch slipped to keep the revs high enough for the exit acceleration. To achieve this the brakes had to be used only moderately, and still retarded the machine enough to allow a very tight apex line. Acceleration from this point is top priority.The 400 could really show its paces, not once being disgraced on the uphill climb and comparing favourably with the full 500's and even making a good showing next to the Ducati's and other big 'urns. 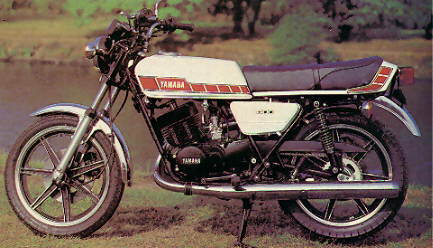 Owing to the frame geometry and a calculated difference in weight distributors from that of its predecessor, the RD 350, our Yamaha never aviated the front wheel, so one just opened up without a care on this point. Wheelies could be done from stationary in first gear . . . as we found out after a refuelling stop. To prevent this we opted for stopping in second for all other pit stops. The handling, although with very light steering, always remained positive and would take on surface ripples without a nod. So much so indeed that after the completion of the race I felt as though I had been on a shopping trip up the high road ! Unfortunately although up to now things had been fine, with only 5 minutes left out of my hour's stint it happened: the Yamaha went on to one cylinder. I made for the pits (my trouble already noticed by John and our mechanic, Graham). First thing to be changed was the spark plug. Even after this it still only fired on one cylinder. So we had to check the timing, where we found that one of the contact- breakers had "modified" itself by cracking across the centre and becoming two pieces. We had no spare available. John and I looked at each other. After a few moments John said, "We have Hillary's RD 250 in the paddock.'' (Hillary is Mrs. Musson, who was one of the reserves.) The paddock is quite a way from the pits so we had to move quickly. The 250 was fitted with full fairing which had to be removed before we could carry out the intended transplant. Since the second set of points had signs of breaking up we decided to change both sets. This episode cost us 42 minutes, approximately 30 laps, dropping us down to 10th place overall and seventh 500 out of the 17 remaining runners. We have no explanation for the failure except perhaps the continuous high reeving or an inherent weakness. Even the replacement set showed signs of cracks at the end of the race. Back in the races John completing his second hour leaving me the last 20 minutes. This time more settled, I began to scratch a little harder and found I was grounding at Park and Charlie's. This was with the rear suspension units set at the one from hardest position. After a look around we found the offender to be the right-hand footrest, which we shortened 3/4in, leaving 3 1/2in, which we found cured the problem. 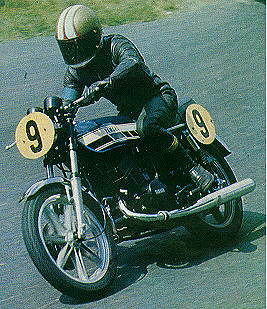 By the time the first leg was ending, several people had problems, such as Roger Moss whose Ducati was only on one due to a broken con rod . . . the piston had jammed at near tdc. With machines not being impounded between legs, several made the start of the second leg after a lot of overnight work, but all we had to do on the Yamaha was check the chain tension, found to be ok, top up oil, plus a general wipe over. Nothing else was required so all we had to do was wait and hope that we could better our 10th place in the next 300ks. As l've mentioned chains, the RE500 Suzuki sealed effort needed no attention, I noticed, and it's now being fitted to the latest Suzuki four- stroke as a standard item, which can't be bad. More details of Yamaha's statistics. The TT100 tyres were inflated to 24 psi in the 3.60in front and 26 psi in the rear 4.10. With softer pressures, TT100s tended to make the rear end roll about. 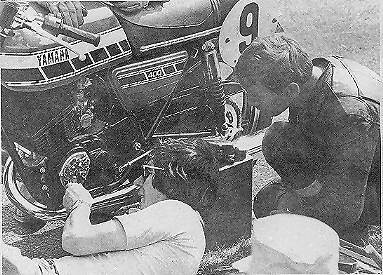 Speed figures are a bit difficult to give with any accuracy but it was found that with 9,500 on the tachometer the speedo gave the following : second, 50/55, third 75/80, fourth 85/90, fifth 95/97, sixth, as for fifth. This last may have been due to the gearing because we had a l7-tooth gearbox sprocket fitted instead of a 16, which would have been more correct for the Cadwell circuit. On the rear-brake pedal, John had problems with the small link bar bending, so this had been reinforced, but with only light pressure it never gave us any trouble. The cost of spares seemed to be rather high. We started the second leg with the other 20 starters but were unable to improve our position. Our pit stops and refuelling took only one minute and this was without any gimmicks, just a two-gallon can and a large funnel. All quite ràpid compared with some of the so- called quick fillers which seemed to leave more petrol on the tarmac than they got into the tank in twice the time. With a few dramatics occurring during this second half, but very few failures, we were unable to improve our positing but completed the race in l0th place. If only those points had not broken, we might have been second overall. My summing up of the Yamaha ? Smooth, with negligible vibration, fast but never giving any sensation of speed. Very comfortable, with accurate steering. More top speed would make this machine a class winner provided flexibility was not cut to any great extent. Our fuel figures were fairly high. With the air filters removed and rejetting, we returned 27.5 mpg. And we turned a TT 100 into a slick !